The next time that the budget is being put together, I hope Republicans will tell airheaded liberals like Betsy Hodges and Chris Coleman to stick it where the sun doesn’t shine when they ask for their LGA increases. I wrote this post to highlight the fact that Chris Coleman was upset that he’d have to cut firefighters or police officers because evil Republicans didn’t give him an additional $3,000,000 in LGA. Because Coleman spent money he wasn’t owed and didn’t have, St. Paul suddenly had a $3,000,000 deficit. Hodges’ spokesperson David Prestwood says it’s needed to “maximize the space.” And it “makes sense to do it now” because the city is slated to also host the X Games and the 2019 Final Four. The job of the 33-member, citizen-led Capital Long-Range Improvement Committee is to review spending requests. Most recently, it scrutinized 97 projects, the plaza among them. The others included construction of a new fire station and sidewalk and intersection improvements so that kids can safely walk and bicycle to school. The panel graded the proposals on various criteria such as level of need, cost, and public benefit. They were competing for a funding pool totaling about $150 million. But the committee ranked the plaza 95th out of 97. We’ve been staking out the four fabled city-financed artistic drinking fountains in Minneapolis recently. We wanted to see what the nearly $50,000 per fountain from our property taxes and water fees buys. You can judge for yourself from the photos. 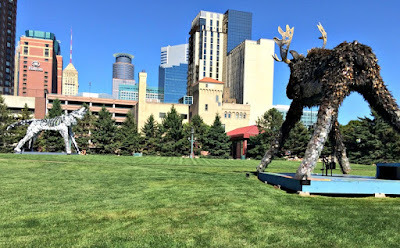 Thus, the only ones standing between spending $11 million on lights, grading, and trees at the convention center plaza is the Minneapolis City Council. 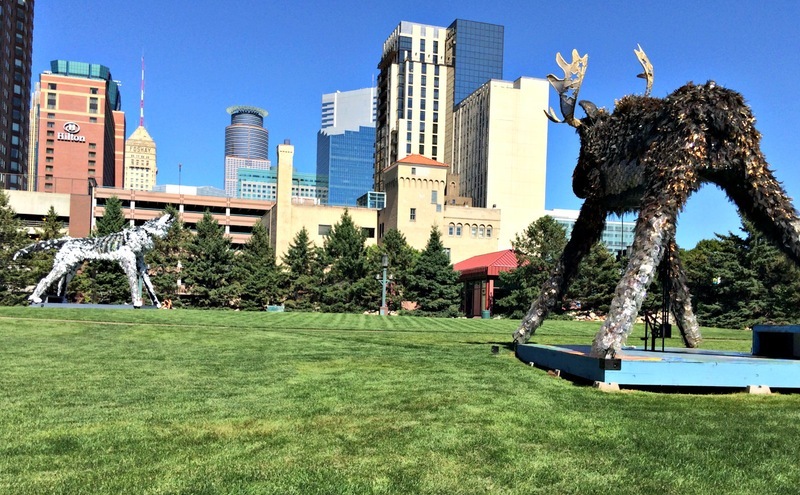 It isn’t surprising that people are leaving Minneapolis as fast as their feet will fly. This post is proof that progressives aren’t interested in having an honest conversation about policy. First, Sen. Stumpf saying that “we have a responsibility in the state of Minnesota to take care of property, the things that the public owns, to make our economy keep moving along” is intellectually dishonest. It isn’t that Republicans don’t think that government shouldn’t maintain essential infrastructure. It’s that Republicans think that projects, like bridges, are multi-generational and shouldn’t be paid for with tax increases that are paid for by this generation. Republicans think bonding makes sense because multiple generations pay for a multi-generational piece of infrastructure. Ms. Bierschbach wasn’t being honest when she said that “But that’s not how House Republicans see things. Many of them consider borrowing for infrastructure just more government spending, akin to credit card debt.” That’s false. The best way to illustrate the absurdity of that statement is by applying certain principles from home life. It’s one thing for a couple with a good credit rating and money in the bank to take out a mortgage to buy a home. It’s quite another to make frequent use of a high-interest credit card to pay for day-to-day things. State bonding for things like museums, civic centers and hockey arenas isn’t wise. State bonding for things like highways and other critical infrastructure should be prioritized. It’s that simple. Further, it doesn’t make sense to raise taxes to pay for building multi-generational pieces of infrastructure. Similarly, taking on long-term debt to pay for things like civic centers, museums, etc. is foolish, too. Finally, it’s time to rethink the criteria we use for bonding projects. The governor’s bonding bill — er, sorry, Dayton and his staff even came up with a far-more-fetching name: “jobs bill” — has little to no chance of going anywhere. And that makes all the effort to get it ready and proposed, as well as the ballyhooed rollout, all that more curious. Anyone with even a hint of cynicism may have smelled politics at play. The proposal has little to no chance of passage because such a bill has to originate in the House, and the House this year is led by Republicans who not only aren’t DFLers like Dayton, they’ve made it quite clear they have no plans for such a proposal right now. Among other reasons for pause, it’s just not the right year. Bonding bills, or jobs bills, if you wish, typically are the products of even-numbered years’ sessions. This session has to be all about passing a budget, which the law requires, and passing a transportation bill, which our crumbling, too-long-overlooked highways and bridges demand. Republicans and DFLers, including Dayton, are far apart on those priorities and others and can spend the remaining weeks of the session compromising and working together with the good of all Minnesotans and their pocketbooks first and foremost in their minds. That’s insulting on multiple fronts. When Republicans unveiled their Transportation Bill, one of the first complaints that the DFL made was that the GOP plan borrowed money while running up the credit card bill to pay for future road and bridge projects. I said then that putting a multigenerational bridge repair project on Minnesota’s credit card was totally justified because multiple generations will be using the bridge that’s getting repaired. The DFL, led by Rep. Paul Thissen, criticized that approach. That’s frightening considering the fact that Thissen’s voted for bonding bills that paid for ‘important’ infrastructure projects like repairing gorilla cages at Como Park Zoo or a sheet music museum in southern Minnesota. Based on the DFL’s actions, it’s apparent that the DFL thinks it’s fiscally irresponsible to pay for transportation infrastructure projects with the state’s credit card but it’s prudent to pay for frivolous projects like museum and zoo repair projects with the state’s credit card. Bonding bills aren’t “jobs bills.” That’s just Gov. Dayton’s and the DFL’s slick advertising name for them. A high percentage of the projects in the average bonding bill pay off special interest constituencies. If you want to give these types of bills an honest name, let’s call them “the special interests’ appeasement bill.” Either that or let’s call them the “special interests’ pay-off bills”. This year, let’s give them this name: dead on arrival. During my time in the Legislature, I successfully authored more than $100 million in bonding projects for the St. Cloud area. This is far more than any representative in local history. St. Cloud State University and St. Cloud Technical & Community College each received tens of millions of dollars from my efforts. Other projects like Quarry Park, the Beaver Islands Trail and various transportation projects also benefited. Unlike past years, the Times Editorial Board never gave me the courtesy of an interview before announcing its endorsement. I was thus unable to respond to whatever concerns it had on this subject. Many other local candidates were granted interviews. I hope in the future the Times gives the courtesy of an interview to all local candidates for endorsements. Jim Knoblach is a House 14B candidate from St. Cloud. Jim Knoblach is running for the state legislature, though you wouldn’t know it based on the Times’ reporting. The average citizen wouldn’t have known that Jim Knoblach wasn’t even asked if he’d like to be interviewed for the Times endorsement. I wrote here that the Times decided that they were endorsing Jim’s opponent long before they conducted a single candidate interview. While Emmer is the likely favorite because of the district’s conservative demographics, voters need to seriously consider whether his political persona will help the district. He’s similarly conservative to Bachmann and he is known as a political bully, which makes his House strategy is “building relationships” a tough sell. Summarizing, the Times endorsed Joe Perske because they think he’d bring home the pork the district is losing out on and because Tom Emmer is a political bully. At this point, it’s difficult picturing the Times Editorial Board as anything more than gossip columnists. They aren’t professional. They didn’t do their due diligence. They didn’t even treat one of the major party candidates with respect. That isn’t just shameful. It’s disgusting. During the three-way gubernatorial debate between Dayton, GOP candidate Jeff Johnson and Independence Party candidate Hannah Nicollet, Johnson repeatedly said that Dayton’s administration hasn’t given enough money and attention to greater Minnesota. “Greater Minnesota in many ways has become an afterthought in this state, whether you’re looking at where we spend our transportation dollars, whether you are looking at K-12 funding formulas, whether you’re looking at some of the regulations that are killing our farmers, our miners and our loggers in this state,” said Johnson, a Hennepin County commissioner. It’s the most accurate non sequitur answer I’ve heard in a debate. The important point to take from Gov. Dayton’s statement is that he didn’t deny that the K-12 funding formula is weighted in the Twin Cities’ favor. Gov. Dayton didn’t deny that overregulation is hurting farmers, miners and loggers. Gov. Dayton didn’t deny that there’s a disparity in transportation funding between the Metro and outstate Minnesota. Gov. Dayton’s defense of this egregious disparity was that the DFL threw some crumbs to outstate Minnesota in the Bonding Bill. Finally, Gov. Dayton didn’t offer proof that the economy in outstate Minnesota was strong. Building a civic center or arena in a small agriculture town won’t help farmers make money. Commissioner Johnson is right that the outstate economy isn’t strong because it’s getting hurt by regulations on the major industries in outstate Minnesota. I rate this Poligraph article misleading. Let’s look at that last statement about being “elected to national boards” if he was doing things he shouldn’t have been doing. Of course he would. That wouldn’t matter to people swimming in the same cesspool. They’re cronies who think that they’re entitled to the perks. In this instance, Mr. Davis went too far. Spending $13,100 isn’t a “small gesture on our part.” That’s spending lavishly and/or extravagantly. Other than identifying that fact, I’d like to know what Community Action of Minneapolis’s employees did to justify this lavish spending. Community Action had an $11 million budget in fiscal year 2011, with over half of its revenue coming from government grants. The audit’s findings put Community Action at risk of losing at least $2.8 million in aid. Now that it’s been proven that Community Action of Minneapolis spent taxpayers’ money foolishly, Gov. Dayton is backtracking. Fast. We don’t need a governor who takes things seriously after the fact. What’s needed is someone who takes steps to prevent it from happening in the first place.